When Dr. John Taylor is found dead in a hotel room in his hometown, the local police find enough incriminating evidence to suspect foul play. Detective Samantha Adams, whose Palo Alto beat usually covers small-town crimes, is innocently thrown into a high-profile murder case that is more intricately intertwined than she could ever imagine. A renowned plastic surgeon, a respected family man, and an active community spokesman, Dr. Taylor was loved and admired. But, hidden from the public eye, he led a secret life--in fact, multiple lives. A closeted polygamist, Dr. Taylor was married to three very different women in three separate cities. And when these three unsuspecting women show up at his funeral, suspicions run high. Adams soon finds herself tracking down a murderer through a web of lies and marital discord. With a rare combination of gripping storytelling, vivid prose, and remarkable insight into character, Alice LaPlante brings to life a story of passion and obsession that will haunt readers long after they turn the final page. 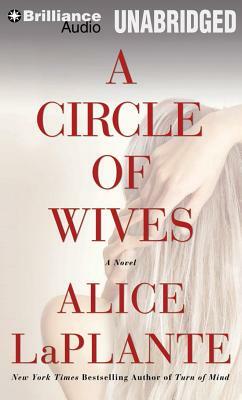 A charged and provocative psychological thriller, A Circle of Wives dissects the dynamics of love and marriage, trust and jealousy, posing the terrifying question: How well do you really know your spouse?